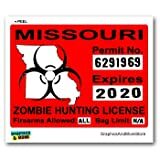 Get the ORIGINAL Zombie Hunting Permit from Big Cat Sticker Shack. There have been companies copying our design and we can't guarantee the quality of their stickers. Big Cat Sticker Shack is the ONLY manufacturer of this original design. 2014/2015 United States Zombie Hunting permit. This vinyl bumper sticker/decal is printed with UV resistant inks and digitally cut on weather resistant PVC Vinyl. Big Cat Sticker Shack specializes in high quality bumper stickers. Our stickers are printed on PVC Vinyl, the same kind sign shops use for vehicle wraps and vehicle signs. That means they are made to withstand the weather. We print them with a state of the art printer using UV resistant inks and cut them with a digital vinyl cutter. The end result is tough, weather resistant bumper stickers with photo quality images that will not fade for years!